"And right before the sharptooth could lay its ferocious claws on its next victim- Bumble of Bee appears to save the day! With a mighty leap he scrambles onto the sharptooth's back, distracting it and allowing the poor soul who was just about to become its lunch time to scamper away back to safety! But Bumble is done with this beast roaming the tribes lands and hurting the ones he loves, so instead of fleeing with his tribe-mate he stays and continues to give the beast everything he's got as the brute tries to knock him off. Bumble kicks, scratches and stabs the large cat... and after a few long moments the beast topples to the ground." Well not in reality, but that was how the story he was telling to the kits went. But once of the npc kits rolled their eyes "Sure." and in response Bumble of Bee would let out a small grunt. "Pthhhpth... well obviously it didn't actually happen. Have some sense of imagination though would you?" He'd tell to the child who was already walking away, his brows furrowed for a moment before he let out a small sigh. It took him forever to come up and tell the whole story about how he saved the tribe from the sharptooth invasion! How was that not super cool and interesting? One day he'd find someone who appreciated his stories... one day. Grumbling he slowly gets onto his paws with a loud yawn and a stretch before looking around the cave... what was there even to do today? He wanted to do nothing but chill and relax... maybe even go sunbathing and tell a story or two... Maybe someone would like to go with. "Does anyone want to hang out with me...? I'm going outside to chill out in the little patches of grasses we have. Company would be cool." He asked, his ears perking up hopefully. If no one approached it was fine he suppose, just chilling with more people other then yourself was always nice. Don't bother with him, Comet's mind whispers to her. But Comet was barely a To-Be herself. Shouldn't she interact with cats her own age? Besides, those kits completely blew him off. It was the least the tuxedo cat could do. Don't do it, Her mind sounds bored, just like she feels. Comet has yet to do much of anything to do, besides watch the grass grow. And in a place such as this with no grass, you can see her point. "Hi, I'm Comet," Come introduces herself to Bumble happily, to the dismay of her conscience, "I'll sit with you, if you'd like." 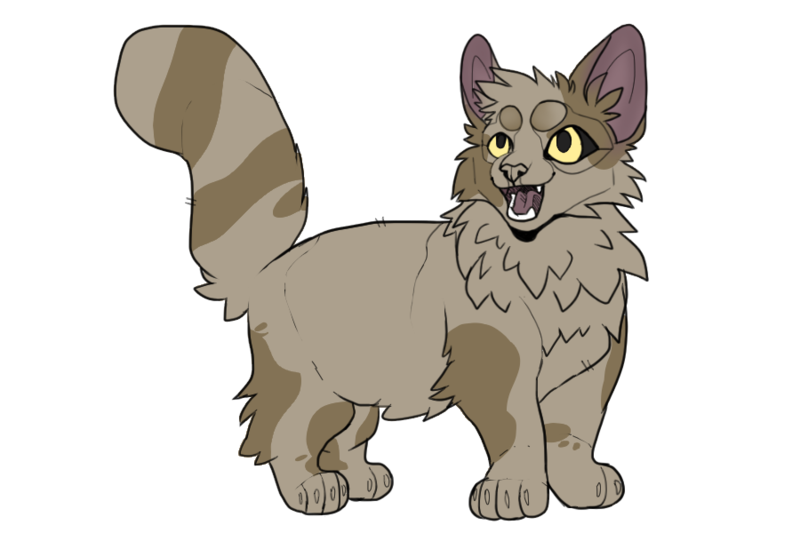 Dim yellow eyes would shift over in the direction of Comet, a cat he hadn't talked to much before but considering they were relatively the same age obviously he had seen em around before. Though he was admittedly hoping for his sibling, Bat, to show up he wanted to get to know his other tribe-mates as well. This worked! "Ayo, I'm Bumble!" He greets and introduces himself back, he was happy at least someone would be willing to chill with him for a bit... Though in the sun admittedly it probably wouldn't take him too long to doze off, especially with a belly full of prey but he promised himself to maintain a conversation and stay awake. So with a nod he purrs, "Great! You wanna grab something to eat? I'm starving." He was always hungry. His tribe-mates would be quick to catch onto that, eating was fun and it made all his worries fade away, he could probably eat a whole piece by himself but he knew it'd be polite of him to ask. But he made it to the fresh-kill pile and ended up digging out a decent sized bird before looking back at Comet with a small tilt of his head. "Iwf ywouw do'wngt wanwt any, down't worriiy." He attempted to say through the feathers, before he grunted and dropped the piece of prey any. "I can eat it by myself if needed. You wanna go outside then? It's been rather warm lately for once and that don't happen too often here!"